Clothes2U was nominated for a Business in Excellence Award, non profit division (Langley Chamber of Commerce) in October 2016 and in October 2018 and was nominated for a Serving with Distinction award (Surrey Cares Foundation) in February 2018. Clothes2U is a registered non profit society that provides clothes,toys,linen,diapers,books,footwear, personal and small household items FREE to those in need, male/female, baby to adult. We will limit and monitor items taken in order to ensure a fair distributionThis is done by way of organized events held in schools and churches across metro Vancouver and the Fraser Valley. There is no storefront, the help is only available through the events. The above mentioned items are given away free at these events, but we do charge admission of $1, under 12 is free. Clothes2U was an offshoot from a single parents group started by Ernie Jantzen in the 1990’s. Some clothes were available for the single parents to take at the meetings but it slowly developed a life of it’s own. 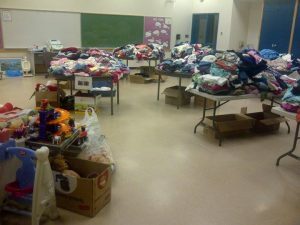 The first clothing giveaway was held in the parking lot of Nicomekl Elementary School in Langley in partnership with Home Church Langley who meet there Sunday mornings. 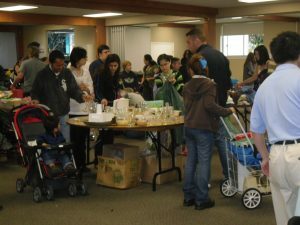 This initial Clothes2U event showed a powerful need in the community for this service so Clothes2U was born. Slowly, additional items to give away were introduced and now we give away clothes, toys, linen, books, footwear, diapers, personal and small household items. These are for male and female, baby to adult. Over time this service has been made available in other cities besides Langley, Richmond, Burnaby, New Westminster, Vancouver, Surrey, Delta, Abbotsford and Chilliwack.